Peppermint. Chocolate. Rice Krispie Treats. What’s not to love here? These are one of my all-time favorite holiday treats because they’re kind of fancy, yet so super easy to make and everyone loves them. I first posted this recipe back in 2011 and it was long overdue for a little facelift. Back when I originally posted this, I wrote the recipe with peppermint marshmallows, but I actually like them better with regular white marshmallows and peppermint extract. The color and flavor are better, in my opinion. So first up, melt up those marshmallows with some butter. I always toss the mallows in melted butter and then heat everything up, it seems to be much smoother that way. You know when you crush candy canes and you get some larger chunks and then lots of pepperminty “dust”? 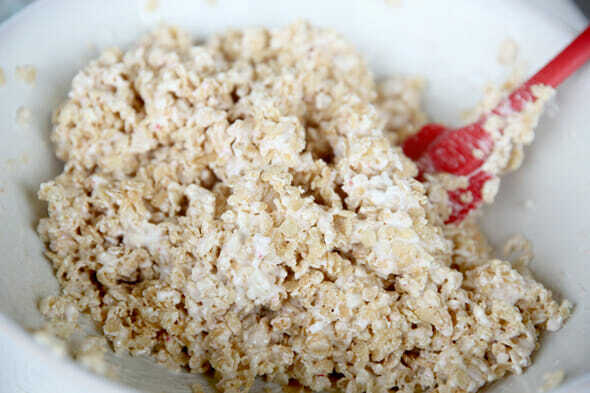 Save the chunks and toss the dust in the bowl, along with a little peppermint extract. One tip when you’re making Rice Krispie treats (or any bar cookie really) is to line your pan. It makes it SO much easier to cut out nice bars without having to smash half the pan in first. Make sure you use butter to grease the bottom of your pan as well. If you use non-stick spray, it will leave a foul tasting residue on your delicious little treats and then they won’t be delicious anymore. After they’re all nicely patted on there, drizzle a little semi sweet or dark chocolate over the top and also a little white chocolate or almond bark. I like to use a spoon and let big chunks of the chocolate fall on there. It’s yummier that way. If you really love peppermint, you can also add a little peppermint oil (not extract) to the chocolate, or use melted mint chocolate chips instead of regular. 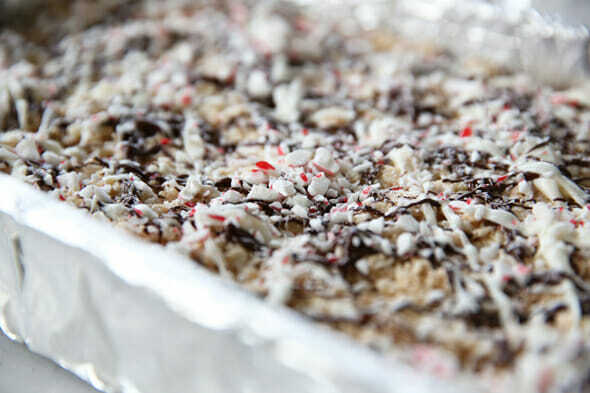 Then just toss crushed candy canes on the top to stick to all of that chocolate. And let it all set up. You can pop it in the fridge to speed up that process. Quick, easy, no-bake, no-fuss. Might be the perfect Christmas treat! I should also mention that I wrote this recipe for a 10oz bag of marshmallows, because that’s a common size. If you make them in a 9×13 pan as written, they will be on the thinner side. If you like your rice krispie treats thicker, you can make them in smaller pan, or do as I did for the ones photographed here and 1 1/2x the rice krispie part of the recipe. That works out perfect for the brand of Kroger marshmallows that I buy that come in a 15oz bag. If you’re looking for more of our Rice Krispie Treats, be sure to check out our ENTIRE SECTION devoted to them! 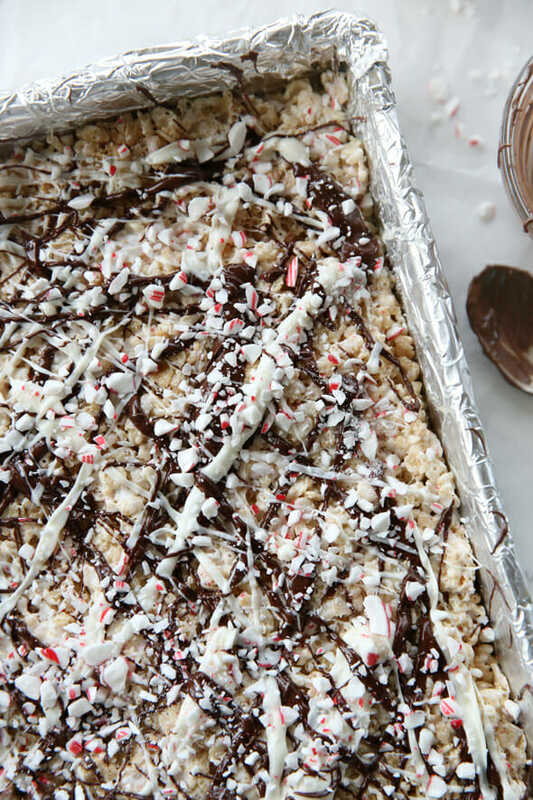 These Peppermint Bark Rice Krispie Treats are perfect and festive for the holiday season! Line a 9×13 pan with foil and lightly butter bottom and about 1 inch up the sides. Place unwrapped candy canes in a heavy duty plastic bag and smash until crushed. Pour into bowl and gently shake so large pieces settle on top and “dust” settles on bottom. Set aside. Melt butter in a very large bowl in the microwave. Add marshmallows and stir to coat. Heat in 30 second intervals, stirring in between, until melted and smooth. (You can do that whole process on the stovetop as well.) 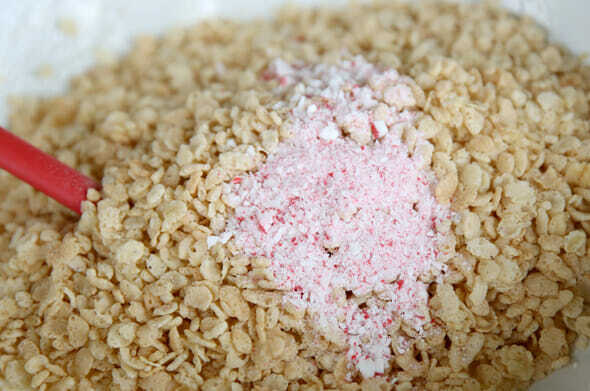 Add Rice Krispies, peppermint extract, and a few tablespoons of candy cane “dust” and stir to evenly combine. With buttered hands, press mixture into prepared pan. Place white chocolate chips and 1/8 teaspoon oil in a small bowl. Heat in microwave in 30 second intervals, stirring in between, until melted and smooth. Repeat same process with semi-sweet or dark chocolate chips. 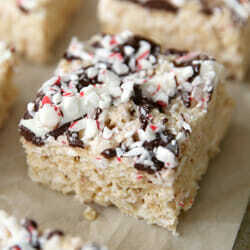 Drizzle both chocolates on top of rice krispie treats and sprinkle candy canes on top. Let sit until chocolate is set, place pan in fridge to speed process along. Cut into squares and enjoy! oh my word! I just did the same exact thing at walmart saturday night! I took one look at them and without another thought, threw them in my cart! Now I have a plan for using them–thanks! And all of us simple-minded creatures were just sitting there thinking “oh, those would taste good in our hot chocolate!” Your brilliance is unequalled. Did you add any food coloring or did the marshmallows make it that pink all by themselves? oh my gosh! anything peppermint! thank you, thank you, thank you!!!!! Haha, I like how fast you made them into something! Thanks to you posting your marshmallow finds, and great recipes, I made something similar to these last holiday season, with the gingerbread marshmallows…folks went nuts for them! ooh, I love the gingerbread ones too; I drizzled those ones with white chocolate last year and they were sooo yummy! And lol- geez, can you imagine if I were to actually post something with STORE BOUGHT COOKIE DOUGH, the world might end right now. I better stick to things like store bought marshmallows which are just chalk full of wholesome natural good-for-you ingredients, haha! How fun! These sound so tasty! Oh my, I must find those! they sound like they would work for so many wonderful treats! Absolutely brilliant. I love reading your posts because I always look forward to your latest, seasonal creations. Oh my goodness! These are going to be so delicious! I think I might have to melt a few up and throw in some rice crispies! Thank you for sharing another nummy dish! I am seriously not trying to be rude because I really do LOVE your website but it seems like the last several months have been either dessert or non food posts : ( My family doesn’t need more desserts but they do need more dinner ideas! Please, please post some soon?? Did you post that anonymously because you were afraid to put your name with it? lol We don’t bite; I promise. Unless you’re mean to us, and then we might nip just a little 😉 Ya know, one thing we’ve learned from doing this blog for a few years is that we can’t please everyone. When we post treats, people ask for dinner, when we post dinner, people ask for crafts, when we post crafts, people ask for dessert…everyone BEGS for diet food but no one comments when we post healthy stuff, lol. It’s a funny thing! So we just try to keep it well rounded, and if you look at our archives, we’ve done a good job of doing so. But when it comes down to it, this is a personal blog and the things we post reflect what we’re doing in our own homes and with our own families and around the holidays, treats and fun activities are our specialty! So yes, you will definitely see more of that because the holiday only comes around once a year. So maybe take a peek at our recipe index for some new dinner ideas- there’s TONS there, I’m sure even some new ones you haven’t seen before. And don’t worry- we won’t post dessert forever! So… lesson learned. No more suggestions. Just enjoy what is posted! I LOVE the costco peppermint bark and I bought some a month ago, well we had company come and as I was unwilling to share it all I gave them some and then tucked it away. Well, I can’t imagine how but I forgot about it…and did I mention I live in Houston? The candy cane pieces were utterly soggy! I was totally bummed, but now there is hope again!!! I am so going to try these because you cannot go wrong with this combo! Thank you! ohhh no! Once I hid my favorite candy because I didn’t want to share and I hid it so well *I* couldn’t remember where I put it! I found it a whopping 6 months later, only to be ruined, lol! Those look so pretty, they make me wish I liked peppermint. I know, kinda strange… I do like a very mild mint but only with chocolate. 🙂 I think the odds of finding someone to make these for who does like peppermint are pretty good though. Maybe this way I won’t eat it all before I have a chance to give it away. Ha! Rice krispy treats were the first thing I made with those marshmallows! I went back to get more and they were all gone!! Next time I’ll have to stock up. Adding the chocoloate sounds fabulous! Seriously!? I had to Pinterest this before I even bothered to read it! cuz well Yeah! I’m gonna make them! hello? Ohhhhh why did I not think of that?! So between the 7000 cookies I always make around this time of the year, I have our first year of preschool with an official-mommy-must-provide-something Christmas Party! These wonderful little beauts may be just what I’m looking forward. And if not, I’ll just eat the whole pan myself! Ah, kindreds! I made Rice Krispy treats using the peppermint marshmallows last week with friends for a movie night. I saved a handful of whole marshmallows to stir in along with about a cup of mini marshmallows. They were so yummy, and YES! They are the perfect Christmas treat! Duh… I meant a cup of mini chocolate chips. And I failed to mention that as I ate them I thought ‘these need crushed candy canes on top’. Great minds! I just got done making chocolate cupcakes. I filled the inside of the cake batter with 4 little peppermint marshmallows and then put the rest of the batter on top. Next Milk Chocolate Whipped icing (from the can, not inspired to make it from scratch today!) and then a great treat for tonight after dinner!!! Next I think I’ll try peppermint fudge!!!! I just saw Jet Puffed’s caramel marshmallows at the store this morning. Those would make delicious rice krispies too, especially with your chocolate chip and white chocolate chip topping (uhmm, minus the peppermint and candy canes though). There’s so many possibilities! Mmmm…those look good! Might need to even brave the freezing weather to get the ingredients! Um, could you please stop posting recipes/crafts that are from your families’ real lives and meet the demands of all of your readers?! BAHAHAHA how ridiculous!! Sara found hers at WalMart. Good luck with your search. This is a nice idea–you are very creative! Okay… you and peppermint must be like me and rice crispy treats!!! You just made my day!! Last year we made them with the gingerbread marshies. MMMM! And thanks for the pan-greasing tips. I always use non-cook spray and yes, it makes them not so wonderful anymore:( Now I’m off to the store! Do you think the chocolate mint marshmallows would be just as good? This is a must, but think it would be cool to have different kinds. I am so making this for Young Women activity this week! I haven’t even seen these and I was at Walmart today! I can’t wait to make these … rice krispie treats and I, well let’s just say, I am quite certainly I have several “curves” thanks to Rice Krispies! Thanks for sharing this awesome idea! Wowsers! These look fantastic! I cannot wait to give them a try! OMG….these look fantastic! My teenage son and his friends devour RKT as fast as I make them, so I can’t wait to have them try these little gems. Oh I am so making this for my cookie exchange!! Has ANYONE found the best invention yet? Already crushed peppermint candies in a bag!! Found them at Walgreens…. bought 3 bags as I absolutely hate crushing candy canes but want them on everything this time of year! Not sure brand — I thought maybe Brach’s but the bag says it’s a Canadian product and manufactured by Karma Candy. Love it!! These look great! I’ve never seen peppermint marshmallows before! Peanut butter + marshmallows = the next flavor I hope they come out with! That would end up on chocolate ice cream in my house! Ok, so when I saw these at Walmart I immediately thought “I wonder if Sara has these ones yet?” I grabbed two bags and put them into the cart knowing I wanted to be prepared for whatever you came up with! I never go to Walmart. I ventured into ours today to get these marshmallows. I can’t wait to use them. 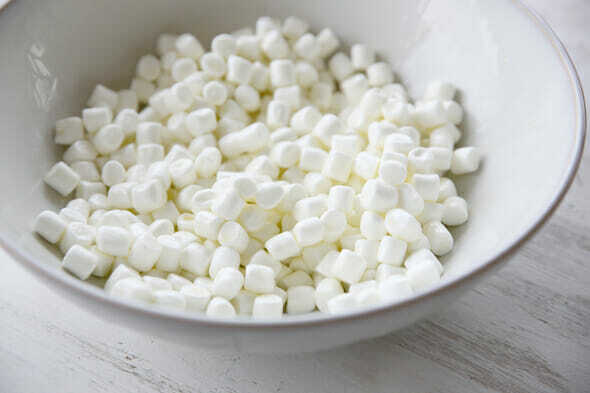 For the past 2 days I have been on the hunt for these marshmallows. I still have a few more stores to check-out. I look in the baking section, end caps and Christmas section. You have opened my eyes to the new world of marshmallows. I never thought about marshmallows coming in different flavors. Today at Target I saw Pina Colada, German Chocolate and Toasted Coconut. 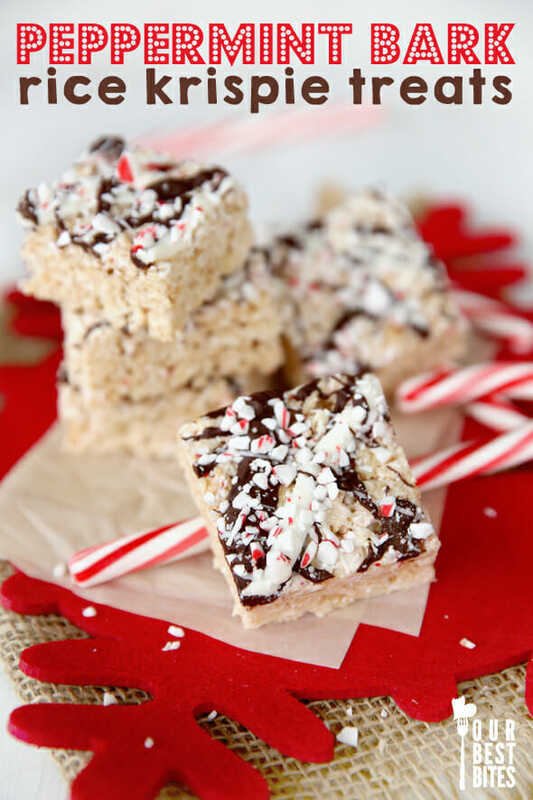 Oh my gosh I saw those in Walmart too and thought of your gingerbread marshmallow rice krispie treats from last year but I wasn’t sure if peppermint and rice krispies would work. Thanks for doing the research for me! You can’t believe how fast I went and made these! I found and used Andes Peppermint Crunch Baking Chips (“Creamy chips with Bits of Peppermint Candy”) on top….WOW is all I can say! Huge hit with the fam! Thanks for this recipe! My advent calendar is full of things I can make with the kids, both edible and not. This will definitely be one thing I can make with them 🙂 Thanks for the ideas…. Thanks a lot for the extra 45 pounds I am now planning to gain after making these every day until Christmas! I tried these last night and they were GONE before breakfast this morning. With these and your mint brownies – I’m in trouble!! If you can’t find the marshmallows at your local Wal-Mart, ask the manager on duty to order some more. I went in Monday to find the store completely out, so I asked if any more were coming in. There were none on order, so she ordered 8 cases. I went back in this morning and voila! 6 bags in my cart and plenty more to be had. This was at the South Jordan wal-mart, for you salt lake valley residents who may be wanting some. I haven’t seen the mini peppermint marshmallows, but at Winco I purchased a bag of really big peppermmint marshmallows. They are flatter than regular big marshmallows so I’m hoping they’ll translate about equally when I make my rice crispy treats this afternoon. Made these yesterday and they were delish! Our store didn’t have the peppermint marshmallows but the regular ones with peppermint and food coloring worked great! The amount of peppermint you suggested worked great! Thanks! I had to search all week and many stores to find these. I did finally find them at one of our Walmart stores. They were with the regular baking supplies, not in the holiday baking end-caps. I cannot wait to make these!! These will be great baked treats! I usually spend lots and lots of time making cookies for friends and neighbors, but I just don’t have the time this year. Thanks for sharing a GREAT simple treat recipe! I am obsessed with making different versions of Rice Krispy Treats and I love this idea! I just realized I have peppermint extract, not oil. Will that ruin the melted chips? off to look for those marshmallows! Couldn’t find the Peppermint marshmallows but Jet-Puffed now has Chocolate Mint ones that I’m going to use in this recipe. I’m curious to see how they turn out! If you are going for looks, definitely use either the peppermint marshmallows or the plain white ones. I discovered with my using the Chocolate mint marshmallows that they turned the Rice Krispie treats a very unappealing shade of gray. They tasted fine, they just looked funny in that color! Thanks for inviting us into your lives, Sara & Kate! LOVE this recipe! You have inspired me! 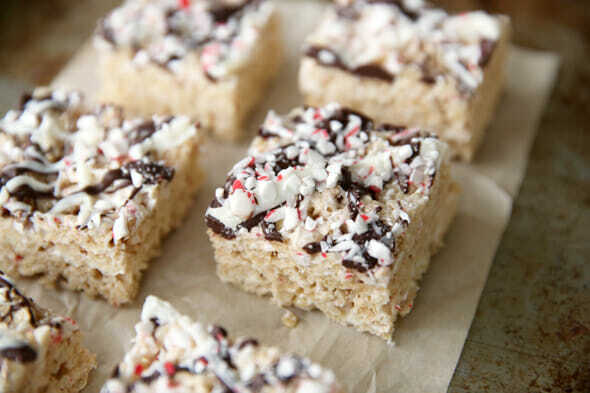 Thought about shaping the krispies into “ornaments”, dipping them in choc and sprinkling with crushed candy canes/colored sugar (kiddos love dipping and sprinkling). Looking for ideas on what to use as a loop for the top..Licorice? I made these this afternoon and they are DELICIOUS!! I found the marshmallows at Walmart; our grocery stores in Lawrence, KS do not have them. I had to add a bit more oil to my white chocolate chips as they were chalky rather than smooth upon melting. Also I needed to melt my chips at 50% power. I had the same problem with my white chocolate chips turning out a bit chalky and not melting like they should have. Instead of adding more oil (which I had already put up and got lazy about pulling back out)I added two tablespoons of milk (2%) instead. They melted up fine after that. Made these today!!! So good!!! Shared them with friends and now I have to make them for my husband’s work Christmas party!!! Thanks for the great great idea!!! Took me 3 days to find the marshmallows! Nom nom nom!!!! Which do you think would be better…the old school candy canes or the softer peppermint nugget thingies? I made these today and they are delicious! I’m not a huge fan of candy canes so I think next time I will get the Andes peppermint bark pieces like someone else mentioned and top the white and dark chocolate with those! Thank you for another winner! I made these for a Christmas open house last night and they were a hit. I loved the easy and cheap preparation, and my guests thought the peppermintiness was a fun surprise. 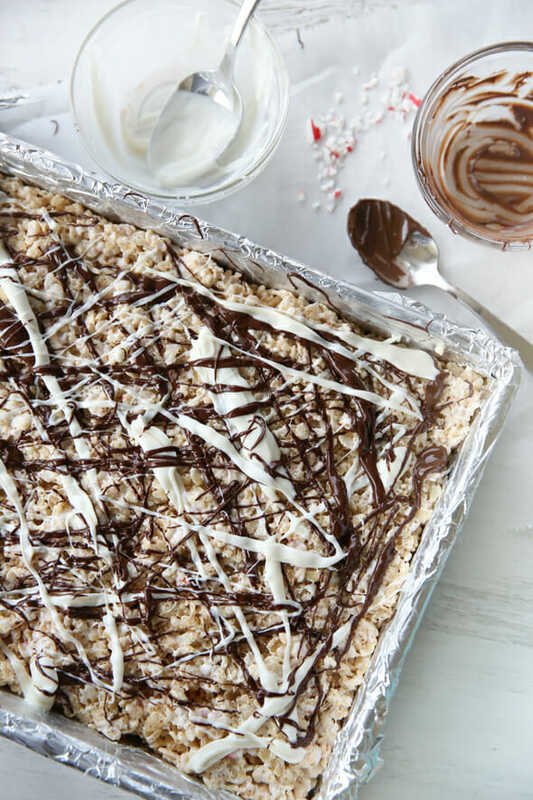 The drizzled chocolate and peppermint pieces on top definitely make them seem special—more than just your ordinary rice crispy treat. `I happened to use the Andes peppermint bark pieces, too, and they were great. I made these last night and they were DELICIOUS!!! I must not have put enough oil in my white chocolate because it wasn’t creamy, and I used milk chocolate–which I added the peppermint flavoring to. YUMMY. Thanks for sharing this recipe, it will definitely be on my holiday goodie plates! why vegetable oil instead of shortening? no matter 🙂 I made these, ate one, and then dropped the rest of them off at my favorite radio station as a Thank You for the movie passes (and other stuff) that I won from them! 🙂 THEY ARE YUMMY! Just made these!! Except I mixed in the Christmas color mini M&Ms instead of putting the chocolate and candy canes on top!! SO GOOD!!!! I made these last night (though I couldn’t find the awesome special marshmallows so I added almost a teaspoon of not-very-strong peppermint extract and a couple drops of red food coloring) and they are SO AMAZING! I don’t know if I can go back to regular Rice Krispies Treats! They will also be great the rest of the year without coloring or dyed green and topped with just the semisweet chips – or Andes mints! Have you seen the Cinnamon Bun marshmallows? Used them in your recipe & drizzled with melted Hersheys Cnnamon Chips & white chocolate. Now I’m making the peppermint ones….YUM!! These are soooooo good. I also found at WalMart Andes soft peppermint baking chips that I sprinkled on top instead of crushed candy canes. Yummy!!!! After much searching through Walmart I almost gave up on making this treat, thinking all your other loyal readers in Spokane had beaten me to the delectable marshmallows. But lo and behold there were a few bags of the jumbo flat peppermint marshmallows left and now the goodness is chillin’ in my fridge, waiting for the family to love them. (Oh and I used the special soft peppermint candy cane sticks for the top crushed stuff.) That was so much fun to make and even though the pink color kind of grosses me out I have to say they turned out pretty too! The next to try will be the chocolate peppermint marshmallows ’cause they had LOTS of those! Thank you and Merry Christmas!!! I’m making these for my hubby’s work Christmas party tomorrow. I can’t try them because I’m gluten-free but I look forward to smelling them! Thanks for the awesome recipe! Dawn, just curious, where it the gluten here, I was going to mke them for my gluten less friend, should I not? Oh gosh, I loooove peppermint! YUM! Funny thing is I was at WalMart earlier tonight and when I was by the marshmallows I saw a little green out of the corner of my eye. Got all excited because I thought they were mint marshmallows but they were lime. Then I came home and saw this post, how funny. Maybe I need to go back and look harder for peppermint ones! I have made these 3 times already!! I made some for my son’s school party, gifted some, and am sharing them tonight at my MOPs meeting. I couldn’t find the peppermint marshmallows at first, so the first batch was made with regular. A Walmart in another county had them, and they DEFINITELY make the difference!! Yummmmmmo! I’m doing a blog post to share the recipe (and linking it back to you, of course!) Thanks so much for the idea!! Holy stinking cow! These are by far my favorite rice crispie treats ever. I too had the candy cane kisses and no white chocolate chips, so I substitutes the kisses. They worked wonderfully but it’s best to drizzle the chocolate first and then the kisses because the kisses turn the same color as the rice crispie treats, and then you loose the pretty factor. I had crushed candy canes left from the peppermint bark popcorn so that was easy-peasy. I’ve looked EVerYWheRe for these peppermint marshmallows and can’t find them, the closest I’ve gotten is chocolate mint marshmallows which I did buy thinking they would be great in the creamy fudge (which is delicious). SO … if anyone out there in UTah has found these, please share where … thank you, I’m becoming obsessed with locating them now that I’ve been all over town looking. I once saw a recipe in a magazine for little Christmas Trees made of Rice Crispy Treats. You added green coloring and peppermint flavoring to the marshmallow and butter mixture. After mixing the treats, butter your hands and shape the treats into little cone shapes (about 1 tablespoon at a time). Roll them in green sugar and little colored candies. Stand them on the broad end. You can squeeze them a little to make them look more like a tree. These look very cute on a cookie plate. these are awesome! i love anything mint and these are so easy and tasty. I made these for a family Christmas party and they were a hit! A friend made these and they are amazing! All I could find though was a 28 oz package of jumbo peppermint mallows & they are flat discs. Any suggestions on how to convert the measurements in place of the miniture sized marshmallows? I am a new reader to your blog and have spent the past couple days or so trying to “catch up.” I saw this recipe and it looks delicious but I thought of something that would make it even better (at least to me). I absolutely love mint chocolate, so the idea immidiately came to me to use Cocoa Krispies intead of regular Rice Krispies…..HEAVEN!!! I just made these but a little differently. I had Andes Peppermint Candy Bits, that I used. I put 1 cup of them in with my marshmallows and they are delightful!! So if you can’t find the marshamallows try for the Andes Peppermint Bits! Thanks for the post!! I had to take something pink to a potluck, and this was the perfect addition. The girls went crazy for them because, honestly, who doesn’t love a rice krispie treat, especially ones jacked up like this?! Thanks for the recipe!